First is a 1913 transit time isochron map for the Peninsula and East Bay to 3rd and Mission — steam and electric trains, as well as ferries. Surprisingly fast, and for the Peninsula, not all that different from today (which makes me very sad). Finally, Eric’s datavisiogeniusness brings us this map of where 45 minutes of Muni gets you. White dots are where vehicles were located the indicated time after they had been to 3rd and Market. Green dots are where these vehicles had been earlier in their trips from 3rd and Market. One thing you can say about Caltrain, though, they sure run a lot more frequently than the SP did at that time. Here’s a schedule from 1908 if you’re interested. True. But check out the expresses! Del Monte Express! Sunset Express! We should bring the names back for HSR. So is the shuttle service on Valencia the original SF&SJRR line with the stop at 25th and Valencia? Well, the original original route actually ran on Valencia instead of just stopping there, didn’t it? 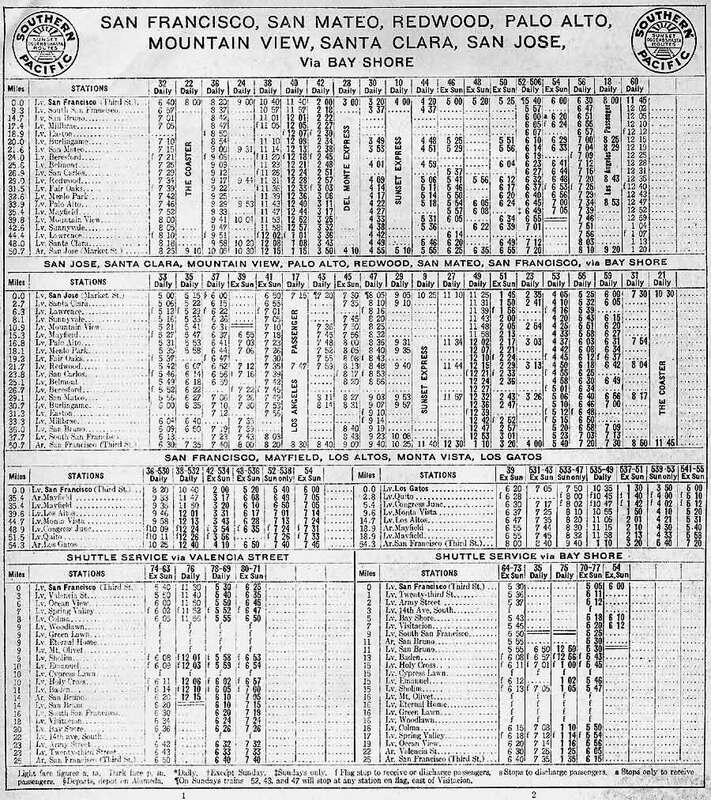 But yes, I think the shuttle on this schedule existed to reach the stations that lost their mainline service when the Bayshore Cutoff was built.